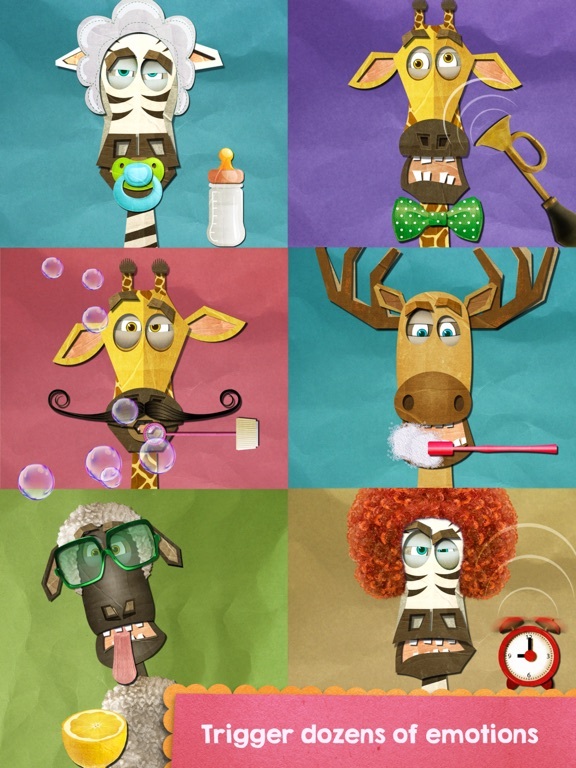 Avokiddo Emotions is an incredibly creative and entertaining app that will inspire children to use their imaginations. 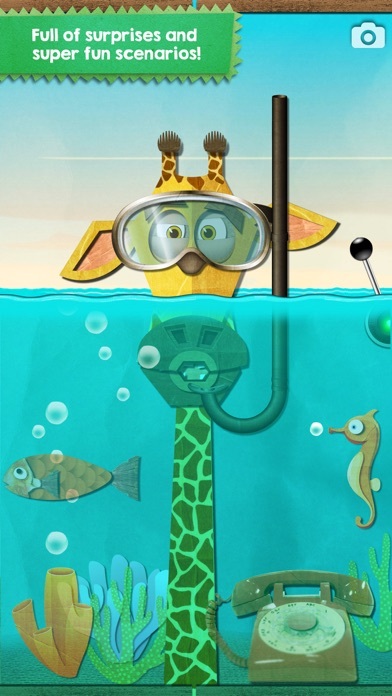 There are 3 different animals (giraffe, zebra, and sheep) that kids can dress up, feed, and explore with a wide variety of accessories that creates a fun and interactive environment for children to play in. 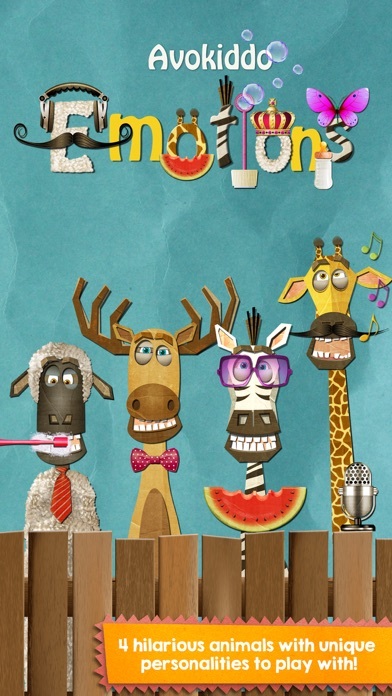 With lively music, sound effects, and silly characters, this app is great for keeping little ones engaged and entertained for hours as they explore various emotions. Avokiddo Emotions is full of high quality illustrations, interactive characters, engaging sound effects, and music that children will instantly fall in love with. 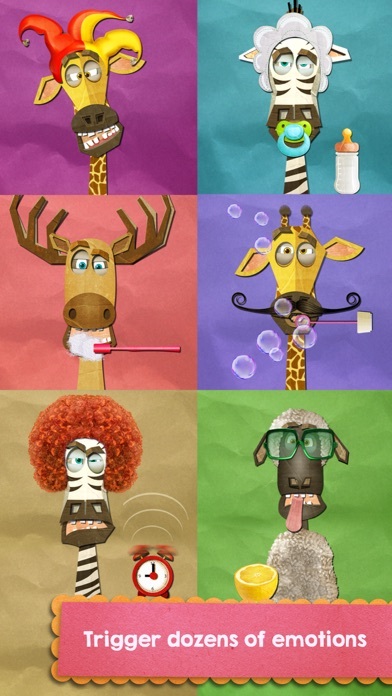 The silly interactive characters and the funny faces they make are very entertaining as the developers have done a magnificent job creating animated animals with a ton of personality. The added accessories and background themes add to the overall experience and allow children to explore their imaginations while having fun in an easy to use virtual environment. 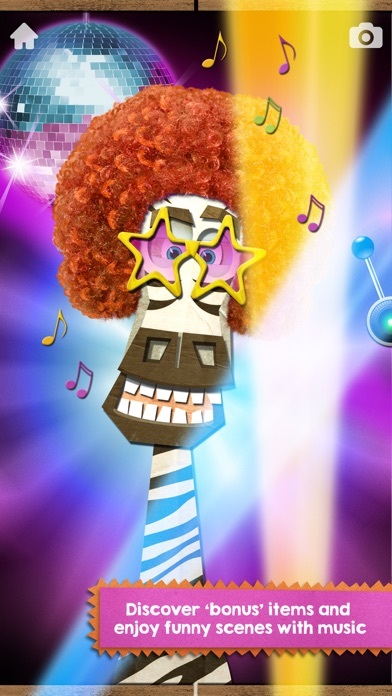 While this app allows children to explore their wild imaginations by using various accessories to elicit a response from the characters, it also teaches them about emotions and facial expressions as they interact with each character. For example, when one of the animals is given a lemon to eat, they make a sour face and respond with a corresponding sound effect and when they are tickled with the feather, they giggle in response. 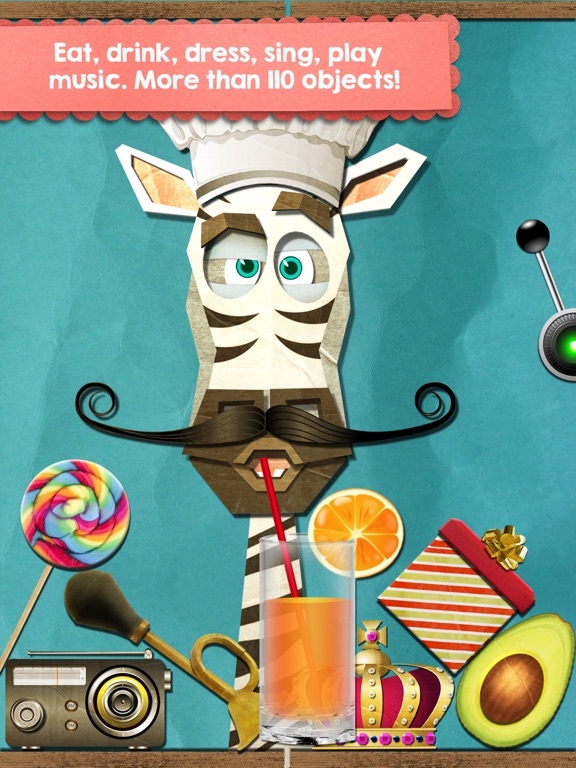 Upon opening the app, users are prompted to select one of three animals (a giraffe, a zebra, or a sheep) and once the animal is selected they can begin playing with the various accessories. The lever on the side of the screen allows children to drop the current items down a hatch while a new set appears. Items like mustaches, hats, instruments, clown collars, and various foods are dropped from above and children can tap and drag any of the items to the character to see their response. 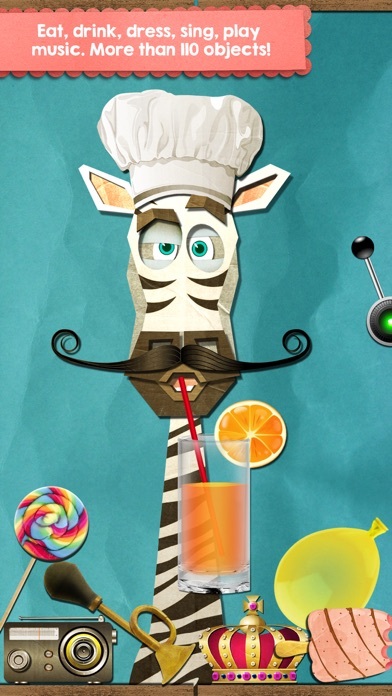 The best part is that you never know which item will change the background of the app and add more animated details. For example, a baby’s bonnet will cause the background to change to a night sky and the character might fall asleep. 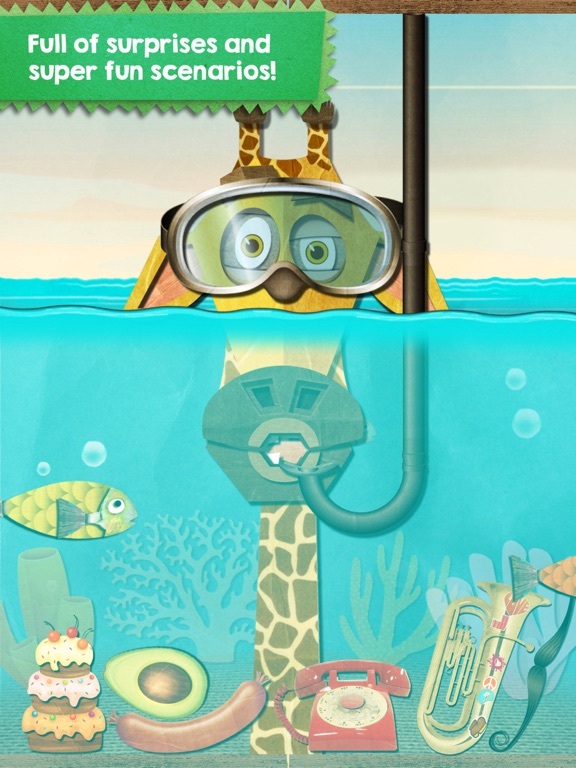 This is one app that is wildly entertaining and will allow children to utilize their creativity with the endless combinations of accessories and they can even take a snapshot of a particular combination to share later. 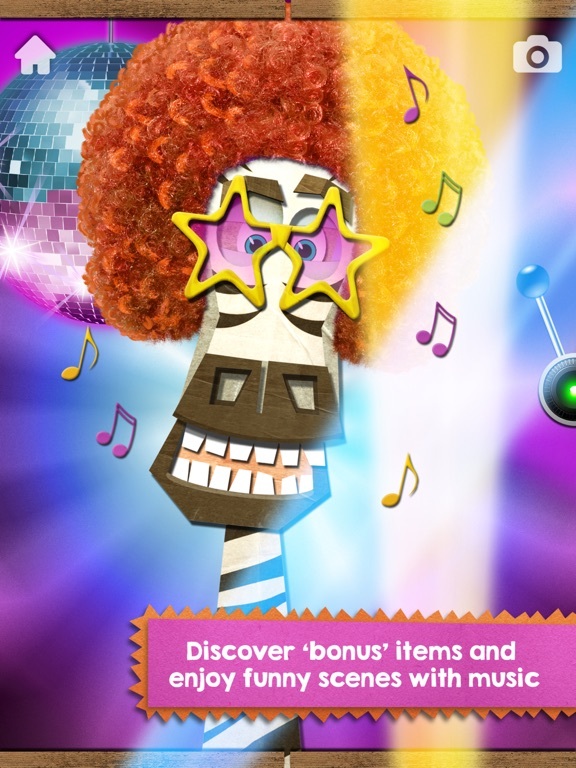 Parents will surely appreciate the high entertainment value of this app and may find themselves sharing in the joy as they play with their child. 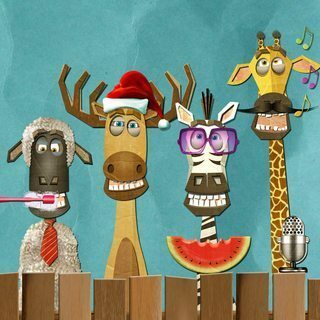 With all of the fun details you might expect Avokiddo Emotions to cost a fortune, but it doesn’t. 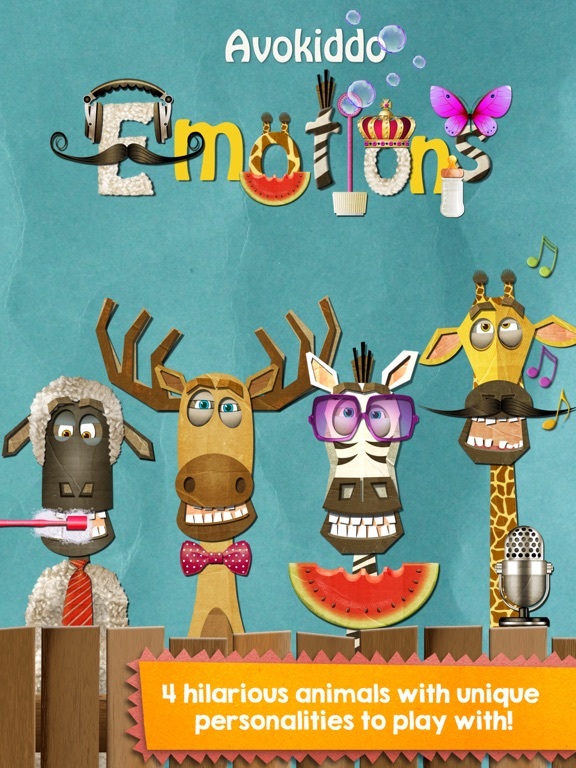 For just under two dollars you get an incredibly entertaining app that will inspire your child to use their imagination while teaching them about various emotions. For the many hours children will be playing this app, this is a great deal! As a parent it is always nice to find apps that are safe and easy for children to use and the developers of Avokiddo Emotions have done a great job of that. Not only is the interface intuitive, but children will not be distracted by flashy advertisements or in app purchases as they play. The main page does have a parents section as well as a place to access more apps, but they are protected. In order to gain access to this area you have to hold the button for a certain number of seconds which is a nice feature. The parents section includes the game settings area where you can set the number of falling objects, select vegetarian food only, as well as select to save the snapshots or not. Information about the developers, links to more games by the developers, and social media links are also included in this area. Parents can rest assured that with children are less likely to get into the parents section and can play this incredibly fun and unique app without a lot of supervision.